This card is no longer part of the Capri.net collection. In the immediate vicinity of the natural arch, an impressive rock formation shaped by centuries of erosion, one finds the restaurant and pizzeria "Le Grottelle". 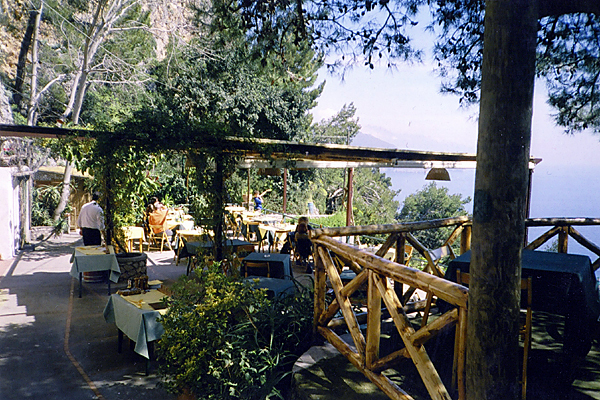 Part of this rustic eatery, including the kitchen, nestles in cave-like hollows carved out of the rock face, whilst meals are served on a beautiful sunny terrace with spectacular views of Campanella point, the Amalfi coast, the Galli islands, and, on a clear day, the distant coastline of Salerno and Calabria. Ideal reward for those arriving at the arch after having climbed the 120 steps at the end of the coastal walk which commences at the Punta Tragara and Faraglioni. Likewise, the restaurant is also the perfect place to lunch before commencing the descent to the "Pizzolungo". The exclusive setting, one of the most charming locations on the island, together with the best of traditional local cuisine and friendly service, makes a meal at the Grottelle a truly wonderful experience.